Winslow Hall was built by William Lowndes in 1700 - the first time Winslow had had a "manor house". The Lowndes were a prominent family in Winslow from the late 16th century (possibly descended from a family from Overton, Cheshire; they first appear in Winslow in the 1570s, and a Geoffrey Lowndes was vicar of Swanbourne from 1565). Click on the image below for the pedigree published in Lipscomb's History and Antiquities of the County of Buckingham (1847; vol.3 p.544). The notes below begin with William's grandfather William and father Robert. The Angel was at the corner of Sheep Street and the Market Square, opposite The Bell. This William Lowndes was the eldest surviving son of Robert Lowndes, d.1602, brother of Thomas Lowndes, d.1622, and father of Robert. He styled himself "gentleman" by 1651. William son of Robert Lowndes baptised at Winslow. 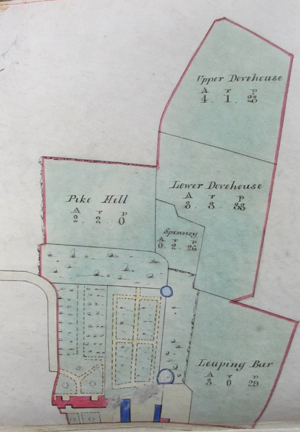 Robert Lowndes mortgages 25 acres of land to James Spencer of Ivinghoe for £151 5s. Leaves to his son Robert: All moveable goods which are mine at or in the house called the Angell in Winslow. To his son Wendover: All my working tooles and all the plough timber in the chamber over the shopp and all the iron in the shid. Robert Lowndes mortgages The Angel and 9 acres of land to Richard Edmondes of Westminster for £283. Birth of Rebecca, daughter of Robert Lowndes. She married John Wyatt of Shipton and died in 1695, leaving 3 children. 1664: Robert Lowndes v Henry Wyatt, concerning an attempt to invest in sheep in Cheshire. A case concerning wine supplied to The Angel by a London cooper up to 1665, part of Robert's financial troubles. 4 Oct 1678. The steward presented a surrender taken by him out of court on 25 April last by Edward Palmer and Susanna his wife of all arable land, meadow, pasture and grassland containing 72 acres, formerly the customary land of Robert Loundes now or late of Winslow gent, previously surrendered or otherwise alienated by Robert to the use of Edward Palmer and his heirs in perpetuity, now or late in the occupation of William Townesend, his subtenants or assigns. To the use of William Loundes of the parish of St Martin in the Fields Scrivener, Robert’s sons. William sought to be admitted. Rent 18s, fine fine £7 4s. 12 April 1680. The steward presented a surrender made out of court on 2 Jan last by William Loundes gent. of all his customary lands within the manor containing 101 acres, in the several occupations of William Townesend sr, Peter Stutsbury and Thomas Tomlyn or their assigns (except for 1 selion, parcel of 2 acres lying near the house of William Elliott, namely the selion next to the highway between Winslow and Shipton). To the following uses: to William Loundes’ use for his life, then to Elizabeth his wife for her life for her jointure and in place of her dower or “thirds” by common law. After the death of both, to the use of the heirs male of their bodies, or for default of such issue to the heirs male of William, or for default of such issue to William’s daughter or daughters for life. After the decease of such daughters, and in default of such issue, to William’s father Robert Lounds and his sister Rebecca for their lives. After their deaths, the 29 acres now in the possession of Peter Stutsbury and Thomas Tomalyn to the use of Thomas Loundes, William’s brother on the father’s side, and his heirs male (for default of such issue, the 29 acres as follows). Concerning all the premisses, after the deaths of Robert and Rebecca, to the use of William’s relative Wendover Loundes and his heirs male. For default of such issue, to Wendover’s brother Edmund Loundes and his heirs male. For default of such issue, to William’s rightful heirs in perpetuity. 15 Oct 1680 (court held by appointees of Nicholas Goodwyn gent.) William Loundes gent. came through Peter Stutsbury and Richard Phipps his attorneys and sought to be admitted to 101 acres (1 selion excepted) surrendered by him on 2 Jan last. Seisin granted as above. Rent £1 5s 3d, fine £10 2s. Fealty respited. William Lowndes' gradual acquisition of property in Winslow from 1679 to 1703 is recorded in Lowndes Roll 1. This also gives details of all his children and some of his other relatives. 1680: Death of Elizabeth, wife of William Lowndes. 1681: William Lowndes buys 55 acres of land from William Spooner. See William Spooner's letter offering to sell. Here lieth the body of Master Robert Lowndes, who died the 26th of January 1683, and is interred under this stone; his father and other of his ancestors having formerly been buried in or near the same place. Mentioned in 1703 marriage settlement of Robert Lowndes and Margaret Atcherley in the area included Pond Close one of ye Rose Closes and all Norden except one acre. Total 33 1/2 acres, purchase price £10 15s. William Lowndes married Elizabeth daughter of Richard Martyn D.D. 1689: Death of Elizabeth 3rd wife of William Lowndes. Also in Winslow Hall building accounts: "for work in taking down cleaning and stacking 60,000 bricks and 12,000 tiles from the old house of Mr Lowndes at Winslow £7 4s 0d for work in pulling down ye ceiling and portions of ye same 12s 8d for work in taking down the roof 10s 8d. Mentioned in 1703 marriage settlement: purchase price £280 "in the sheep street now demolished to build my new house"
Also in Winslow Hall building accounts: "paid for work in pulling down Scotts house which stood in the street next that in ye tenure of Ben Sounders" 3s 0d. William Lowndes pays George London and Henry Wise, his Majesty's Gardeners, for fruit trees "to plant the garden then made now next ye new house"
William Lowndes returned as Member of Parliament for Seaford, one of the Cinque Ports. "Enabling Nicholas Goodwin the elder and the younger to sell the manor of Winslow (Buckinghamshire) and to purchase other lands to be settled to the same uses"
Nicholas Goodwin acquired the manor from the Duke of Buckingham's trustees in 1679. 1700: Date above the south door of Winslow Hall. 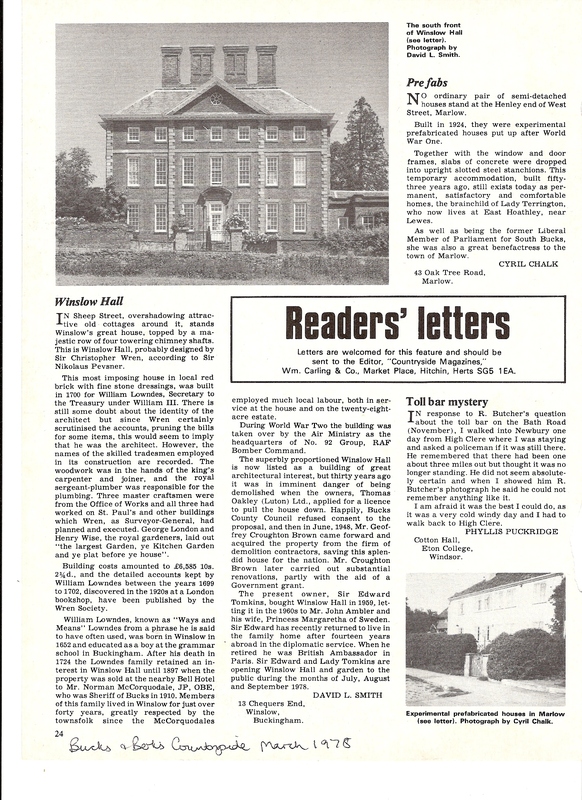 The accounts for the building of Winslow Hall were published in: Wren Society vol.17 (1940): Designs and drawings supplementary to volume XII (1935). The building cost £6,585 10s 2d, and used 48,000 roof tiles and 1,140,300 bricks (35,000 of which were reused from the previous house). See Lowndes Roll 1 for details of the houses pulled down and the land acquired for the garden. Transcription of some of the Winslow Hall building accounts 1700-03 (mainly brickwork, building expenses and the garden). William Lowndes' accounts, 1699-1702 show his dealings with agents and tenants while he was building the Hall. Winslow Hall, 140 yards S.E. of the church, is a building of three storeys with an attic and cellars. It is dated 1700 and has been attributed to Sir Christopher Wren or one of his pupils. The walls are of brick with stone dressings; the roofs are covered with slate. The house is a fine example of domestic architecture of the period. The plan of the main building is rectangular with a projecting bay in the middle of each wall; a modern wing of one storey, containing the entrance hall, has been added at the E. end on the site of a former extension, and there are low modern additions on each side of a covered passage, which leads to a building of two storeys containing the kitchen. The arrangement of the interior of the main building is symmetrical, peculiarities being that all the fireplaces are in the axial wall, and that in each corner of the house on each floor, including the cellars, there is a small square chamber, those on the upper floors having been used probably as powdering-closets: on the ground floor the eastern two-fifths of the N. half form a Hall, with the N.E. corner chamber as an ante-room between it and the modern entrance hall, and the western three-fifths contain the Dining Room, with the N.W. corner chamber, used as a pantry, beyond it. In the S. half, the eastern three-fifths contain the Drawing Room, with the S.E. corner chamber as an anteroom, and the western two-fifths the Library, with the S.W. corner chamber opening from it and used as a Study. The staircases are in the projecting bays at the E. and W. ends of the house. The upper floors are each divided into four main rooms in the same way as the ground floor. 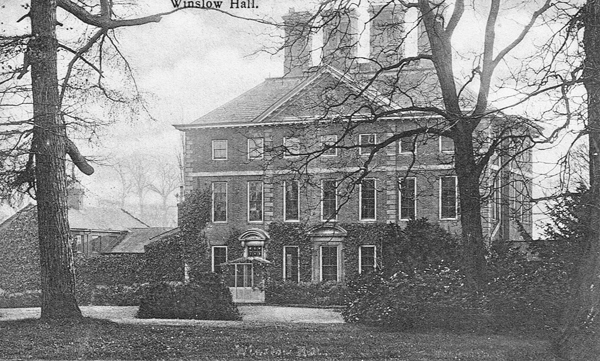 The marriage settlement transferred Winslow Hall and the manor of Winslow to Robert and his male descendants. After building Winslow Hall, William Lowndes continued to buy up property in Winslow. Some of this was adjacent to the Hall, and if on the south side of Sheep Street it was demolished to create the open view which characterises Winslow now (see photo). He kept careful records of his purchases 1715-20 in a notebook, which is also a valuable source as it contains many extracts from 17th-century court rolls. There are more in Lowndes Roll 2. In 1716 (see manor court) he put into a trust all the property in Winslow which he had acquired since 1703: 8 messuages, 1 cottage, 1 toft and 286 acres of land. In 1722 he recorded his rental income from property in Winslow and elsewhere in a document headed "My Reall Estate per Annum", which also mentions the demolished houses. William Lowndes' 1709 notebook records some Winslow-related income and expenditure, and there are also accounts for Winslow from 1722-23. 1724: Death of William Lowndes, 20 Jan.
A case concerning Robert's debts and the seizure of his goods by bailiffs. Wednesday last Robert Lownds of Winslow in the County of Bucks, Esq; having been making a Visit in that Neighbourhood, upon his Return home, alighting from his Horse, fell down dead. 1727, 16 Oct: Inventory of Robert Lowndes esq. This important document shows how the Hall was furnished and how the different rooms were used at the time of Robert Lowndes' death. Under the will of William Lowndes, Winslow Hall and its estate were already entailed to Robert's son Richard Lowndes. He was the first Lowndes to be born to great wealth, and went to Eton and Oxford. 19 April 1733: Anne, daughter of Richard and Essex Lowndes, born at Westminster. 31 March 1735: William Lowndes (later William Selby), son of Richard and Essex Lowndes, baptised at St Martin in the Fields. 16 May 1737: Mary, daughter of Richard and Essex Lowndes, baptised at St James Westminster. The portrait on the right is of Richard Lowndes by Thomas Gainsborough. It was sold at Sotheby's in 2010. 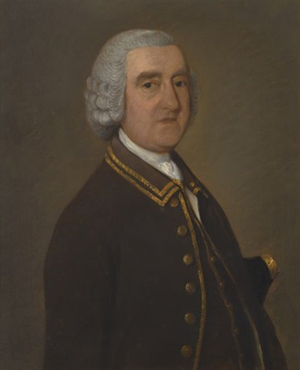 Richard served as MP for Bucks from 1741 to 1774 without ever contesting an election, but is only known to have spoken once in the House of Commons. Richard Lowndes, the moving force behind it, receives multiple allotments and builds new farms like Red Hall Farm. 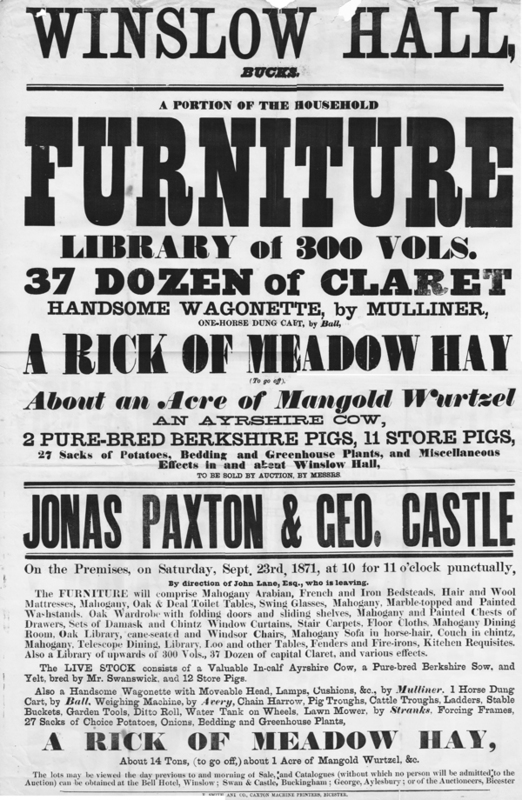 Stolen or Strayed, out of Shipton Pastures, in the Parish of Winslow, Bucks, on Sunday, the 23d Instant; a Black GELDING, rising four Years old, a Star on his Forehead, and a small Snip; both his fore Feet white, and a little white in one of his hind Feet; round carcassed, with clean flat Legs; his Tail is nicked and cut square, and he carries it high; he stands about fifteen hands, high; his Shoes, if not altered, marked H.R. 21 Jan 1766: William Lowndes (later Selby) marries Mary daughter of Thomas Goostrey of Missenden Abbey. See his will for details of thier 9 children (only 2 of whom had children of their own). Richard Lowndes retired to Hillesden with his two unmarried daughters and handed over Winslow Hall and estate to William. William Lowndes receives multiple allotments and builds new farms like Tuckey Farm. 1767: Birth of William, son of William and Mary Lowndes. Mr Selby you hear is dead, & being always, I believe, a very strange man, has shewn himself so by his will, and cruelly so, for he has left Whaddon Chace & his Estate to Maj. Lowndes, "if his heir at Law cannot be found". Did you ever hear any thing so hard, it is leaving him a Law suit or nothing at all. Thomas James Selby of Whaddon Hall was a hunting connection of Lord Jersey, who lived at Middleton Stoney. 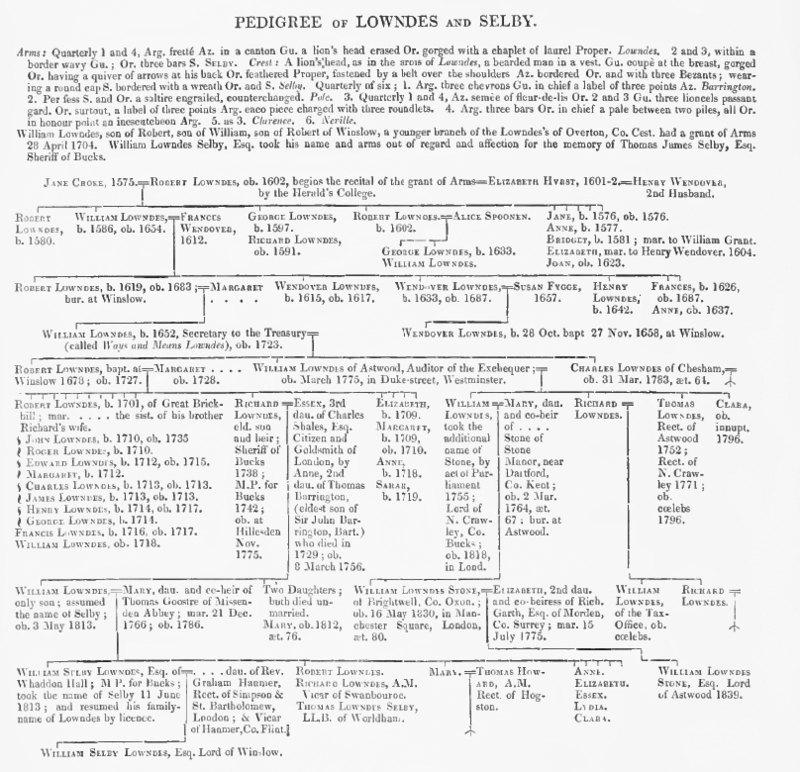 Selby's will required William Lowndes to take the name of Selby to inherit his estate. There was a protracted legal dispute but the will was eventually upheld in 1782, as no legitimate heir appeared within the required time. William Selby / Lowndes later rebuilt Whaddon Hall and it became the family's principal home. Richard Lowndes aged 68 buried at Winslow. He was MP for Bucks 1741-74; see his biography on the History of Parliament website. Will of Richard Lowndes of Hillesden, 1775: it mainly concerns his property in North Crawley and Swanbourne. Will of Robert Lowndes of Bletchley, 1779 (proved 1783); a younger brother of Richard, with some property in Winslow. Will of Mary Lowndes Selby, 1785 (proved 1786): under the will of her father Thomas Goostrey she was able to make her own arrangements about her property despite being a married woman. Will of Mary Lowndes of Cosgrove, 1805 (proved 1812) and Will of Anne Lowndes of Cosgrove, 1812 (proved 1817): daughters of Richard, sisters of William Selby. Their wills lists all their nieces and nephews, William Selby's children. William Selby Lowndes of Winslow and Whaddon buried at Winslow aged 72 years (he died on 17 May). He was MP for Bucks 1810-20; see his biography on the History of Parliament website. See his will. Clara Hartman subsequently married William after Lucy died in 1852. Edward Selby-Lowndes, William's younger brother, married another Hartman sister, Mary, and lived at Selby Lodge (later Redfield). The ENGLISH INSTITUTION of MANNHEIM is REMOVED to WINSLOW in BUCKINGHAMSHIRE. - Dr. Lovell informs his friends that he has taken a large Mansion, with extensive grounds, at Winslow (ten miles from Aylesbury), where his School will be RE-OPENED after the present vacation, on the 1st of AUGUST next. Dr. Lovell is now in town. The terms, references, & c., can be had of Messrs. Field and Bolton, Lamb's Conduit-place, Guildford-street, London. 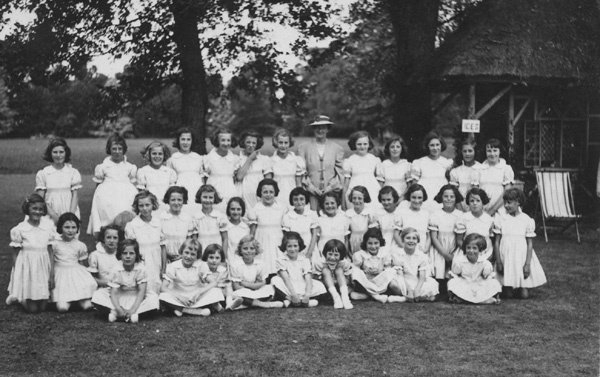 Ed Grimsdale has written an article about Dr Lovell's school, Ground-Breaking Multilingual Education in Victorian Winslow, and traced the stories of some of the pupils. John Cawte, Gamekeeper, aged 40, b. Twyford, Hants, lived in the adjacent house (on the south-east side). Deaths: Dec. 4., at Winslow Hall, in the 6th year of her age, Eleanor Matilda, daughter of Henry Lovell, Esq., D.C.L. Wanted, directly, a respectable young man, as GENERAL HOUSE SERVANT, in a large Establishment, where a boy is kept. Apply by letter, stating length of service and wages expected, to Dr. LOVELL, Winslow Hall, Bucks. 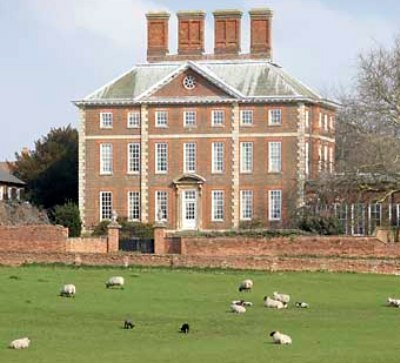 There was now a gamekeeper in the house between Brook Hall and Winslow Hall (either 11 Sheep Street or the building which was originally the west pavilion of Winslow Hall): James King, 43, b. Whitfield, Northants, + family. 1865-8: Winslow Hall was the home of a lunatic asylum for 30 patients run by Dr Theodore Boisragon. Read more. Sale of contents and livestock by Jonas Paxton & George Castle, "by direction of John Lane, esq., who is leaving". Mr Lane seems to have gone in for farming as well as drinking claret. Click on the image to see the sale poster. On the plan, the red represents Winslow Hall, and the blue is what is now the Coach House and White House. Greyhound Lane is on the left of the plan. Pike Hill, with no trees marked, is now the Arboretum. 3 more male servants lived in the next household to the south. The Lambton parents, Henry and Elizabeth, were at their London residence, 47 Eaton Place, on census night. In 1885, they bought Selby Lodge from the Selby-Lowndes family, and renamed it Redfield (it was also known as Winslow Court at first). SELBY-LOWNDES, WILLIAM, of Whaddon, Stony Stratford &c. Club: Carlton. b.1807, succeeded 1840, m.1st 1833, 2nd 1854. Bucks. 7,537 acres; gross annual value £11,923. 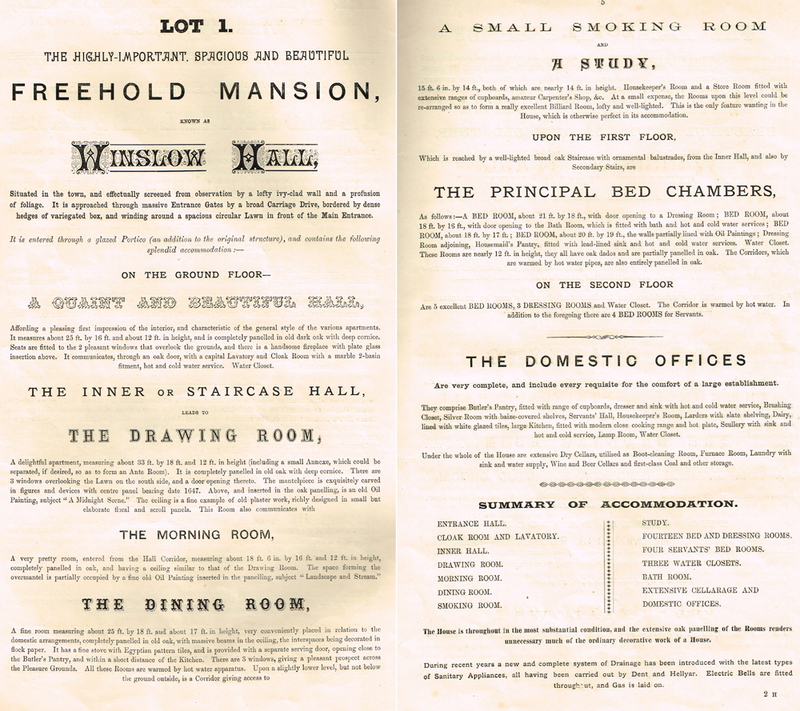 1897, 27 July: Sale of Winslow Estate by William Selby Lowndes. On Tuesday afternoon Mr George Wigley submitted to public auction, at the Bell Hotel, Winslow, the estate known as Winslow Hall, comprising the mansion itself and several grazing, dairy and milk farms, besides accommodation holdings, allotments, etc., the whole comprising 1,399 acres. There was a very large company, and the bidding for some of the lots was very spirited. Winslow Hall, with its grounds and several paddocks and enclosures of grass land were not sold. There was also about 32 acres of grassland, let to Silvanus Jones, James Hawley, Charles Clare, W.S. Neal, George Wigley, Mr Lee & Mr Saunders. Winslow Hall is a commodious, but plain brick, edifice, standing at the entrance of the Town from Aylesbury. Until recent years it was approached by a handsome flight of stone steps leading to the south front, over the door of which is the name of William Lowndes, and the date of its erection, 1700 the Architect being Inigo Jones; a modem carriage way now leads to the north front of the house. The Lowndes Family must have had a mansion at Winslow long previous to this, for we find mention in the Church Register, that Robert Lownes of Winslow was married to Jane Croke on the 4th. June, 1575; a Edward Lownes was buried there Aug. 30, 1575; Jone Lownes the wife of Robert Lownes, was buried on 8th, June, 1589, and a Richard Lownes on the 28th June, 1591. The name of W. Lovnes appears on the Sanctus Bell dated 1611. On several occasions, a member of this family has been elected to represent Buckinghamshire in Parliament, the most eminent being William Lowndes Esq, chairman of the Committee of ways and means in the House of Commons, and commonly called "Ways and Means" Lowndes; he died in 1723-4 and on the 22nd of January, Mr. Chancellor of the Exchequer acquainted the House of Commons "that this House has lost a very useful member, and the Public as able and honest a Servant as the Crown ever had, by the death of Mr. Lowndes." A contemporary account states-"January 28th, 1723, the corpse of William Lowndes Esq., was this day carried out of town, to lie in state at his seat at Chesham. Jan 29th, the Funeral procession of the late Wm. Lowndes Esq. left his seat at Chesham, and proceeded to his other seat at Winslow. The body lay in state there during the day till late in the evening, when it was interred at the Parish Church at Winslow.". The following lines were written as an Epitaph to his memory. Gain a quietus which shall ever last." A Richard Lowndes of Winslow, was Sheriff of Bucks in 1738, and M.P. for the County in 1742 and 1754. He died at Hillesden in 1775, and was buried at Winslow. Pete Smith, "Winslow Hall", in M. Airs & G. Tyack (eds), The Renaissance Villa in Britain 1500-1700 (Reading: Spire, 2007), 223-46. More about the book. In 2007 Tony Blair and Cherie Blair were said to be interested in buying Winslow Hall, but ultimately didn't. This article from the Daily Telegraph includes some photos of the Hall at the time (unfortunately putting Winslow in Berkshire).